ScreenIn3D is a new joint venture company set up by AMS Bio and the University of Strathclyde exploiting the latest advances in microfluidics and 3D culture to develop a novel microfluidic screening platform. 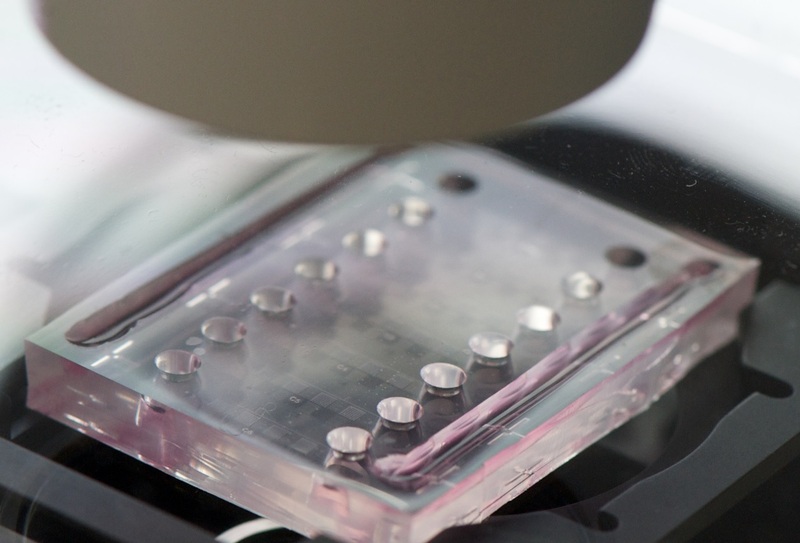 The combination of microfluidic lab-on-a-chip technology with physiologically relevant 3D spheroids is designed to make drug discovery more closely relevant with what happens in the body. The ability to micro size drug-cell interactions will allow pharmaceutical and biotech companies do 100x more testing for the same money spent as well as increasing productivity as it enables more experiments to be done on the same platform at the same time. OncoScreen service - the first application platform launched by ScreenIn3D is targeted at improving anticancer drug treatment and accelerating development of new personalised medicine solutions using patient derived tissue. Chosen by the Society for Laboration Automation & Screening (SLAS Europe) as an exciting innovation technology company (presented at SLAS Europe 2018), the OncoScreen service offers users the ability to reduce and replace animal models in cancer research. As well as offering 100-fold greater throughput than existing cancer screening assays for same cost OncoScreen also provides a larger screening capability of patient derived tissue than any existing services. Alex Sim, Managing Director of AMS Bio and ScreenIn3D says, "The OncoScreen platform presents exciting possibilities for testing patient-derived multicellular tumor spheroids/organoids (comprising cancer cells, stromal cells, cancer stem cells and/or immune cells) for disease/biomarker-oriented drug activity and profiling using single- and pair-wise standard/targeted drug combinations. We are actively seeking partners and investors to fast track development of further platforms. Additional R&D grants to enhance our immunotherapy and neuroscience programs are being applied for with our collaborators."